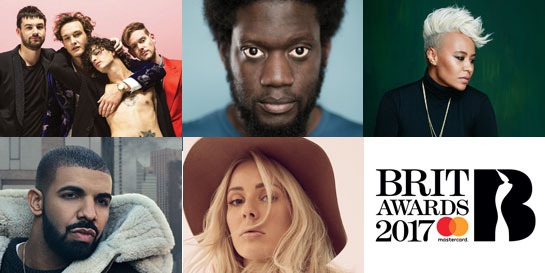 Polydor has notched up five finalists, all in heavyweight categories. Michael Kiwanuka is in the running for British Male Solo Artist, whilst his album Love & Hate is a contender for Best Album. The 1975 are nominated for Best Group, and their album, I Like It When You Sleep For You Are So Beautiful Yet So Unaware Of It, is also in the Best Album list. Ellie Goulding, meanwhile, is up for Best British Female. Elsewhere, Virgin EMI signings, Blossoms, are in the British Breakthrough Act category. The label also sees two-time BRIT winner Emeli Sandé recognised in the Best British Female list and Bastille make the cut for Best British Group. Fast Car by Jonas Blue ft Dakota is up for British Single and British Artist Video, whilst Rihanna is amongst the International Female Solo nominees. Rihanna receives two other nods for her feature on Calvin Harris’ This Is What You Came For. Island, meanwhile, is represented by Drake and The Weeknd in the International Male Solo Artist category and by Drake & Future in International Group. Sean Paul’s features with Clean Bandit and Little Mix receive three nominations across two categories. The BRITs takes place on the evening of 22nd February at London’s O2 arena and will be televised live on ITV. Emeli Sandé and The 1975 have both been confirmed to perform on the night, with more announcements due soon.